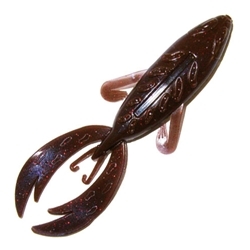 The Big Bite Rojas Fighting Frog is available in two sizes and a number of fish catching colors. Unlike traditional frogs, this bait is designed to be used flipping, pitching, Carolina rigging or as a jig trailer. Frogs have always been used as topwater baits, however, The Fighting Frog takes frogs to a whole new level of fishing and is a new type of flipping bait. This frog is made to be used below the surface and give fish a new and realistic look. It features a compact body with small front legs for subtle action and larger back legs that have great swimming action. When fished with a light weight, it has a natural gliding action on the fall or a heavy weight can be used for faster presentations. It is also the perfect follow up bait when you miss a strike on a topwater frog. One of the most important features of this bait is the innovative new design of pockets and grooves. The Fighting Frog has hook pockets on the top and bottom, but the key is additional grooves on the sides. These channels and grooves prevent the bait from balling up on the hook and interfering with hooksets.